this sounds interesting mrshock i do like intermixed stories in a movie if it is done well, i will take your advice and try this one. how is the 2wks of horror going, you in your element now with all horror reviews. 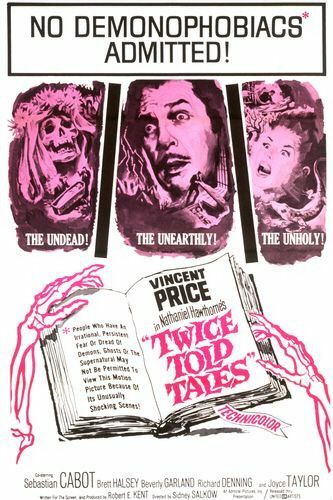 TWICE TOLD TALES is certainly an interesting film, and a well-made one. As I said in my review, there are elements other than horror in the film, but I still found it a very entertaining watch. The 2 weeks of horror are going well. I'm literally "up against it" with reviews, though (I finished this write-up of TWICE TOLD TALES at 11 p.m. yesterday, 4 hours before it was scheduled to post), but I'm still having a great time! firsst time here figured id check out the doc while waiting for the next episode of planet macabre podcast. nice website i like the quick searchability with the genres and the letters. Hello, and thanks for stopping by. I do appreciate it, as well as the kind words about the site. And the next episode of Planet Macabre will be here one week from today. From the look of the films, it'll be an interesting one!